Conversations lets you have two-way interactions with leads and customers using a chat widget and email. All customer conversations are stored in a unified inbox, allowing you and your team to easily manage communications as well as provide and access context around customer issues, questions, sales wins, interactions and more. If you are the Primary Admin of your ActiveCampaign account, you can access, enable, and configure the Conversations feature so you can have two-way conversations with your customers. To get started, click “Conversations” in the left menu. 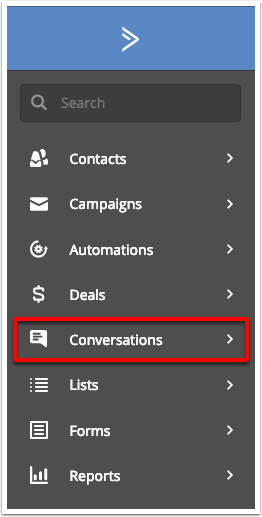 If you do not see the Conversations option in the left menu, then you will need to contact your Primary Account admin to request access. Once you’re on the Conversations page, you’ll be able to start a 14-day free trial or purchase seats for the feature now. The number of seats you purchase will determine how much the Conversations feature will cost. This will be in addition to what you currently pay for your account. Note that only users who have a seat in Conversations will be able to access and use the feature. You can add or remove seats as needed and swap out which members from your team can use a seat. After opting into the trial or purchasing seats, you’ll be redirected to Step 1 of setting up Conversations. Click the “Team” dropdown and select which team will be using the Conversations feature. Select if your entire team will be getting access, or if the access is limited to you for now. Note that you are limited to 20 seats in Conversations. If you have more than 20 users in your ActiveCampaign account, the last 20 users added will be granted access. Set the Desktop notification toggle to “On” to enable desktop notifications. When set to on, you’ll receive an alert on your desktop every time you receive a new message from a visitor. Note that you’ll need to have the Conversations unified inbox open in your browser to receive this notification. You can turn this setting off at any time. Set the Audio notification toggle to “On” to enable audio notifications. When set to on, you’ll hear a sound play when you receive a new message from a site visitor. You can turn this setting off at any time. Click the “Next: Chat Appearance” button to proceed with setting up the chat widget. In this section, you’ll learn how to configure the chat box appearance. You can set the appearance for the chat widget so that it matches your company’s brand. Doing so will create a seamless experience for your visitors. Note that it’s not possible to remove ActiveCampaign branding from the chat widget during the trial period. Once you purchase seats, you'll be able to toggle the branding off. Type your company’s name or welcome message in the “Headline” field. This will appear at the top of your chat widget when it’s opened by a visitor. For example, you can type "Chat with us" in the headline field. Type a short bio for your company in the “Description” field. This will also appear at the top of your chat widget when it’s opened by a visitor. Note that this is optional. Paste the URL of where your company logo is stored into the field provided. You will see the image shown in the box to the right so you can verify it looks okay. Under “Brand Color,” click the color picker and select the color you would like to use in the chat widget. You can also enter the hex value. Under “Chat Position,” select if the chat widget should appear on the left or right of your webpage. In this section, you’ll learn how to create an Auto Reply Message, set up an Email Capture Form, and configure a Follow-Up Message. The Auto Reply Message will appear in the chat widget as soon as a site visitor submits a chat message. This is enabled in your account by default. You can turn it off at any time by setting the toggle to “Off.” Next, type the auto-reply you wish visitors to see directly into the message box. You can use the Auto Reply Message as an opportunity to collect information for follow up in case you’re not able to respond to their inquiry right away. With the Auto Reply Message, visitors will never be left hanging if you’re not able to engage with them in real-time. The Email capture form will appear in the chat widget for visitors and will display after the auto reply message. The Email Capture Form is enabled in your account by default. To turn it off at any time, set the toggle to the “Off” position. Note that you will not be able to customize the Email Capture Form. If a visitor submits their email address to this form, a contact record will be created for them in your ActiveCampaign account. From here, you can add them to automated workflows where you can add tags, add notes, create deals, create tasks and more. Note that if the email address already exists in your account, a duplicate contact record will not be created. Email addresses collected from this form are not considered opted-in contacts as they did not explicitly consent to receive marketing messages from you. If you would like to invite a visitor to opt into your marketing list, you can include the link to your form in your Follow Up Message (see next section below) or send them an email from your own email client and include a link to your subscription form. The Follow Up Message will appear in the chat widget after the visitor submits their email address to the Email Capture Form. This message is enabled in your account by default. To turn it off at any time, set the toggle to the “Off” position. Invite visitors to subscribe to your list by providing a link to your online subscription form. Provide links to help articles for frequently asked questions. Once your happy with the configurations on this page, click the “Next” button to go the “Install Code” step. To get the chat widget to display on your website, you’ll need to whitelist your domain(s) and install the chat widget code onto your site. In this step you'll need to whitelist all domains and subdomains you want the chat widget to appear on. Adding your domains and subdomains in this step will also enable site tracking. Note that if you do not whitelist any domains, the chat widget will not appear on your site, even if you install the chat widget code. If you check the "Include all website pages" box, all pages on the URL you supplied will have the Conversations chat widget. This will not include any subdomains; those will need to be whitelisted separately. Using the example above, if you whitelist "mysite.com" and check "Include all website pages" then all pages that include "mysite.com" will have the chat widget on it. If you also have the subdomain, "help.mysite.com" that will not be included. 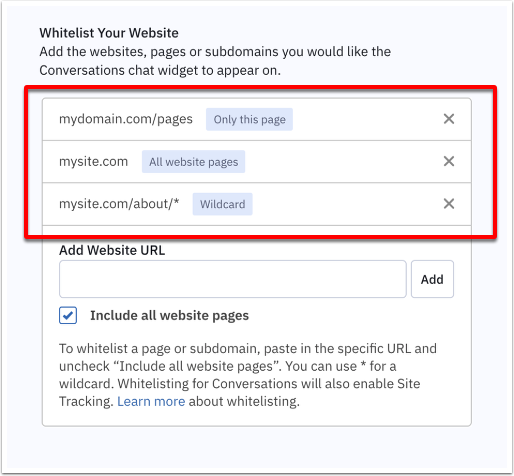 You will need to list that subdomain separately in this step if you want the chat widget to appear on that page. If you do not check the "Include all website pages" box, only the URL you supply in this step will have the chat widget appear on it. Note that you can add as many specific pages as you like. A wildcard URL uses the * symbol to indicate that "any page in this path" will have the chat widget appear on it. For example, if you whitelist "mysite/about/*" then the chat widget will appear on all pages that start with "mysite.com/about/." You can also use whitelist domains that contain wildcards in the middle of the URL. For example, you would whitelist "mysite.com/*/test.com." Click the “Copy” button to copy the code and paste it to the footer of your site. Click “Use WordPress Plugin” to go to the ActiveCampaign plugin page on the Wordpress site. From here you can download and install the plugin. This plugin will let you insert forms, track page visits, and add the Conversations chat widget to your site. Note that if you currently have the ActiveCampaign Wordpress plugin installed, you’ll need to upgrade it to the current version (7.1) from this page in order to add the chat widget to your site. When finished, click the “Next: Test & Finalize” button. On the Test and Finalize page, you’ll be able to preview and test the chat widget on all domains you whitelisted and added the chat widget code to. In addition, you’ll be able to see how incoming messages look in your Conversations Unified Inbox. To view and test the chat widget on your site, click any of the URLs listed on the Test and Finalize page. Once you’re ready to start taking incoming chats, click the “Launch Conversations” button. You'll now see the chat widget on your site.